Matrix... a sweet "polar bear", sometimes with an impetous temperant he likes entering the fray, yet elegant on the move. An enthusiastic dog all the time, happy to be by my side. hindquarters, in good coat. Presented a very nice outline. 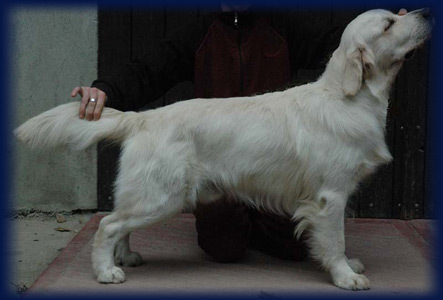 ....1 year, exc type and proportions, masculine head, exc pigmentation and neck, exc. hind and rearquarters, well developed deep chest, exc. topline and movement. 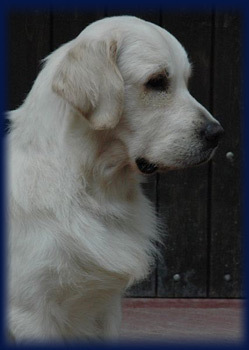 …6 months, typical expression, correct pigmentation and dentition with good head - muzzle proportions. Correct topline, exc angulations and body proportions. Good hindquarters, typical movement with exc. tail carriage.